We celebrate the incredibly rich history and traditions of China at Golden Flower, Wynn Macau’s highly acclaimed two-star Michelin restaurant. Also recognized by Forbes Travel Guide with its prestigious Five-Star Award, Golden Flower’s expansive menu allows you to select from a wide range of favorites, including signature dishes such as braised Yoshihama abalone in brown sauce, stewed fish maw with crab claw in supreme chicken soup and imperial dessert. A variety of Tan, Lu and Sichuan dishes, as well as a range of vegetarian options, are also available to ensure every member of your party will enjoy a delicious, authentic experience. Chef Liu's knowledge of Tan cooking is a direct inheritance, handed down from the Tan household itself. In his illustrious 40-year career, he was the first Mainland Chinese chef to receive the Rôtisseur award from the Chaîne des Rôtisseurs. He has served dignitaries including the Queen of England and Chinese leader Deng Xiao Ping – and now, you. Enjoy an exquisite dining experience featuring premium ingredients, ancient traditional recipes and supreme culinary crafts, combined into rarefied Tan, Lu and Sichuan delicacies such as stewed fish maw with crab claw in supreme chicken broth and tea-smoked chicken. The result is a truly refined setting in which you will savor the area's best Tan cuisine. Two private dining rooms, each accommodating up to 10 people, are also available. 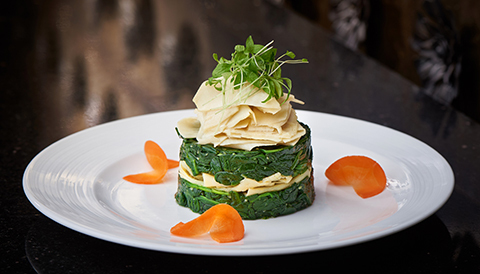 Experience deliciously light, nutrient-rich dishes prepared in inviting and invigorating ways, featuring fresh vegetables like spinach, Chinese toon and bamboo shoots, combined with the luscious flavors of clams, mandarin fish, crab and duck.